A Boxerdoodle is a cross between a Boxer and a Poodle. It’s not hard to guess the reasons behind crossing a Poodle and a Boxer to get a Boxerdoodle. Both breeds are known for their intelligence, athleticism and success as family dogs. In recent years cross breeds, including the Boxerdoodle, have become popular. Before discussing the merits and shortcomings of this particular designer dog, it is essential to point out the ongoing debate between purebred and crossbred canines. Have you ever heard of the Otterhound? How about the Chinook? Lagotto Romagnolo? They are all dog breeds recognized by the American Kennel Club. Some contend that while the American public is going gaga for designer dogs, other breeds are falling out of favor. Some, like the Otterhound, may even be facing extinction. The Kennel Club UK recognizes 215 breeds, while the American Kennel Club recognizes 190. Many support maintaining the purity and sustainability of these breeds. Of course, even pedigree dogs at one point were created by crossing breeds in order to select for specific physical and behavioral characteristics. Supporters of cross breeds often argue for hybrid vigor, a theory that refers to an increase in desirable qualities such as size and fertility in a hybrid over those of its parents. A study done in England on the longevity of dogs supports hybrid vigor. During the study, 102,609 deceased dogs were analyzed. Results showed that the longevity of hybrid dogs exceeded that of purebred dogs by 1.2 years. Over the past several centuries, purebreds have been maintained by inbreeding within closed familial lines. This has preserved certain desirable attributes. The unintended consequence, however, is that disease-causing genes have also become fixed within a breed. However, hybrid breeders who don’t take care in the testing of the parent dogs could wind up with puppies carrying faulty genes too. If a breed is expanded via a small number of founder dogs carrying a diseased gene, the disease frequency will increase. Now that DNA testing is available for canines, a combination of breeding strategies and genetic testing can reduce the prevalence of inherited disorders in purebreds and cross breeds alike. Such diligence would likely produce healthy dogs with long lives. When choosing a puppy, then, the competence of the breeder should take priority over the merits of purebred versus hybrid. The Boxer is part of a group of dogs called working dogs. One of his roles has been that of a war-dog, including during World Wars I and II. His warring ancestors actually trace back to the Assyrian Empire as early as 2,500 BC. A big-game hunter used by German noblemen, the dog hunted bear, bison, and wild boar. It was during the late 1800s that the modern boxer came into being. The Bullenbeiser was bred with a smaller breed from England, possibly an English bulldog. This time around, the boxer was bred for guarding and search and rescue. Recognized in 1904 by the American Kennel Club, the boxer really began gaining popularity in the 1950s when a boxer named “Bang Away” won the Westminster Dog Show. Today the boxer is ranked the 10th most popular dog in the U.S. by the American Kennel Club and the 14th most popular in the U.K. by the Kennel Club U.K.
Like the Boxer, the Poodle was bred in Germany, also as a hunting dog. The Poodle, however, was bred as a water retriever for duck hunters. Later, the Poodle became a popular breed among nobles in France and other parts of Europe. Poodles are now considered the national dog of France. The American Kennel Club recognized the breed in 1887. In the early twentieth century, the toy Poodle was first bred in the U.S. as a companion for city dwellers. Many hybrid breeders today use the Poodle to cross with another breed. With her intelligence and non-shedding, hypoallergenic coat, she is very popular among breeders. The Boxerdoodle is a relatively new hybrid, believed to have originated in the United States during the past decade or two. To learn about the many attributes as well as a few shortcomings of this new cross breed, read on. With a mixed breed, it is important to remember that a puppy may inherit physically-determining genes from either parents or a mix of both. Most likely, the Boxerdoodle would be bred with a standard Poodle. Offspring would range in size from 40 to 80 pounds and from 15 to 25 inches. With the wide spectrum of colors that a poodle can display, the coloring of the boxerdoodle could also be along a spectrum including black, a color that is never seen in boxers. The Boxerdoodle could also have a mix of colors. The texture and appearance of the coat can vary. 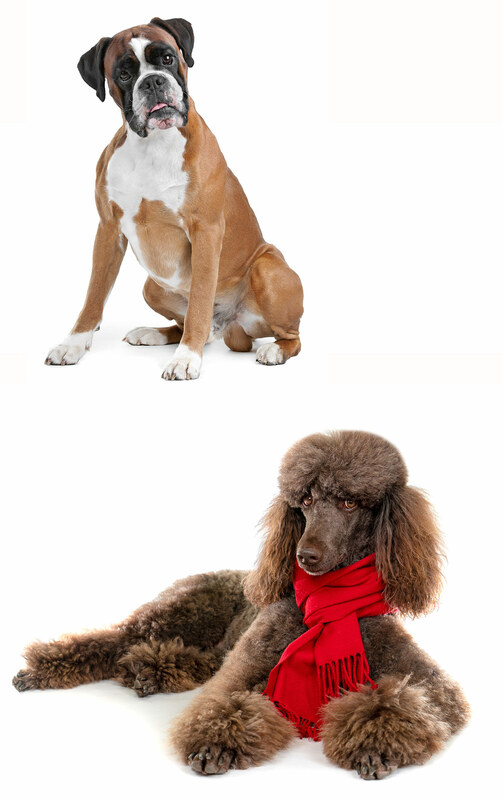 With the Boxer’s short, glossy coat and the Poodle’s curly coat, Boxerdoodles could have a curly, wavy or straight coat. While the Poodle’s hair is both non-shedding and hypoallergenic, the boxer sheds moderately and is non-hypoallergenic. The parent that a puppy favors indicates the amount of shedding he will do. 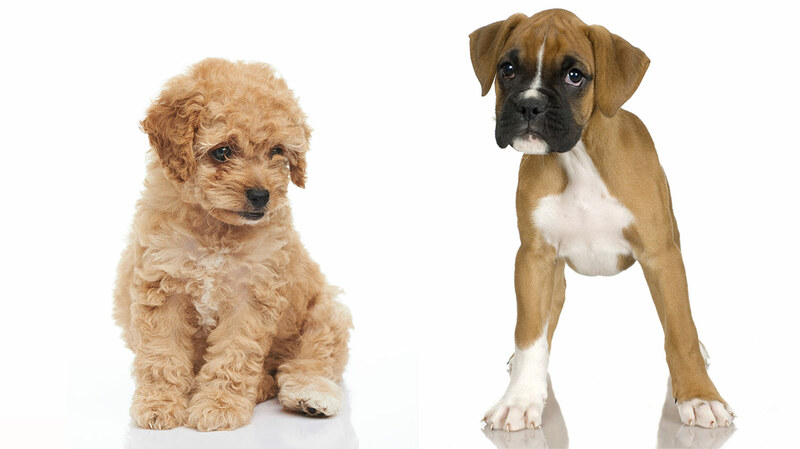 Boxers and Poodles share several characteristics, making it likely that a Boxerdoodle puppy will inherit similar traits. Both are considered intelligent, athletic, active and affectionate. In addition, the Boxer is best described as patient, protective, loyal and alert. Poodles are often described as eager, agile people-pleasers. With intelligence on both sides of her family, the Boxerdoodle will be easy to train. She might, however bore quickly, so mixing it up will help in the training process. Both parents are also athletic, one very agile and one powerful. Agility training or training the dog as a service or work dog would be successful for this cross breed. This might include several walks each day. Playing fetch will honor the heritage of both parents as hunting animals. Games in the backyard or at a park will feed both the dog’s intelligence as well as physical need for activity. One cautionary note for owners of a Boxerdoodle – the puppy will most likely be a jumper. Both boxers and poodles are known for leaping. In their enthusiasm to meet new people and dogs, they will jump up. For this reason, the Boxerdoodle is not a good choice for frail adults or very small children. Early training will be important for the Boxerdoodle. He will do best if exposed to many people and animals when a puppy. Teaching him manners with animal and human meet and greets will be essential in his development. With the boxer’s patience and loyalty and the poodle’s desire to please, the Boxerdoodle would make an excellent family dog. Though he might overwhelm a very small child, a Boxerdoodle would thrive in the environment of an active family. Like most breeds, specific diseases and disorders are inherent in boxers. A heart muscle disease called cardiomyopathy is one. Similar to the human myocardial disease, it affects the right ventricles of the heart. Cardiomyopathy puts boxers at high risk for sudden cardiac death. Hypothyroidism is a second disease to which boxers are predisposed. This disease most commonly develops in 4 to 8-year-old and mid to large-sized purebred dogs. Classical signs of this disease include lethargy, weight gain, exercise intolerance and skin abnormalities. In addition, boxers are susceptible to lymphoma and a variety of tumors. The American Kennel club recommends screening for all of the conditions listed above, as well as hip dysplasia. Finally, because the boxer is a brachycephalic dog, he is predisposed to respiratory problems, hydrocephalus, facial nerve paralysis, skinfold dermatitis, eye-bulb prolapse, and the false positioning of teeth. They are also well known for their tummy troubles! One health disorder to watch for among poodles is hip dysplasia. One preventative measure to guard against hip dysplasia is to avoid overfeeding a growing dog. Poodles are also one of the breeds most susceptible to the development of mammary gland tumors, as noted in an epidemiological study that took place from the years 2002 to 2012. The risk for developing mammary gland tumors significantly decreases if the dog is spayed before her first heat. Other health concerns include Addison’s disease, bloat, chronic active hepatitis, Cushing’s disease, epilepsy, hypothyroidism, neonatal encephalopathy, patellar luxation, optic nerve hypoplasia, and Von Willebrand’s disease, according to the American Kennel Club. As with physical attributes and temperament, a cross bred dog may inherit specific health predispositions from a particular parent or a mix from both. Therefore, all of the disorders mentioned above can affect a Boxerdoodle. It is important though, to pay extra attention to those disorders found in both breeds. These would include hip dysplasia and hypothyroidism. Reputable breeders will test parents for genetic diseases and abnormalities, so doing one’s due diligence is essential. A responsible breeder will make this information available to potential puppy parents. When researching breeders, be sure to meet both of the parents and see their papers. Make observations of the parents’ size and temperament. Ask the breeder how long they have been breeding this particular dog. Find out if a vet has tested both of the parents for the genetic diseases noted above. Also, inquire about a health guarantee and contract on the puppy. Because she is a medium to large-sized dog with high activity needs, a house with a backyard or park nearby would be best for a Boxerdoodle. The Boxerdoodle will need several walks per day and/or outside playtime, so will need an owner with both the time and will to exercise her. With loyalty, affection and a playful spirit, the boxerdoodle would love to be a part of a family. Though her energy and proclivity to jump might require supervision around very small children, she would make a great family dog. She would love the energy of an active household! If you have decided that the Boxerdoodle is right for you, the next step is to find a dog that needs a home. That leaves two routes: finding a Boxerdoodle rescue or buying a puppy from a breeder. Finding a rescue may be a bit of a challenge both because of the popularity of designer dogs and because the boxerdoodle is a newer breed. If buying a puppy, it is vital that you find a reputable and responsible breeder. This may take some investigation. Exploring this website is a great first step. Finding a breeder through word of mouth could lead you to the right breeder and puppy. If researching online, be sure to ask potential breeders for several references. Next meet a breeder (or a few) in person. Go with a list of questions and ask to see the puppy parents. When you do finally locate a breeder that you can work with, be sure to see the parents’ health records, sign a contract and obtain a health guarantee. These procedures will boost your chances of adopting a healthy puppy. Only then can you bring home that wiggly bundle of joy for good.